One of the more difficult things about walking Jeju Olle Trail for visitors with little to no knowledge of Korea or the Korean language is finding a place to stay after a day of walking. 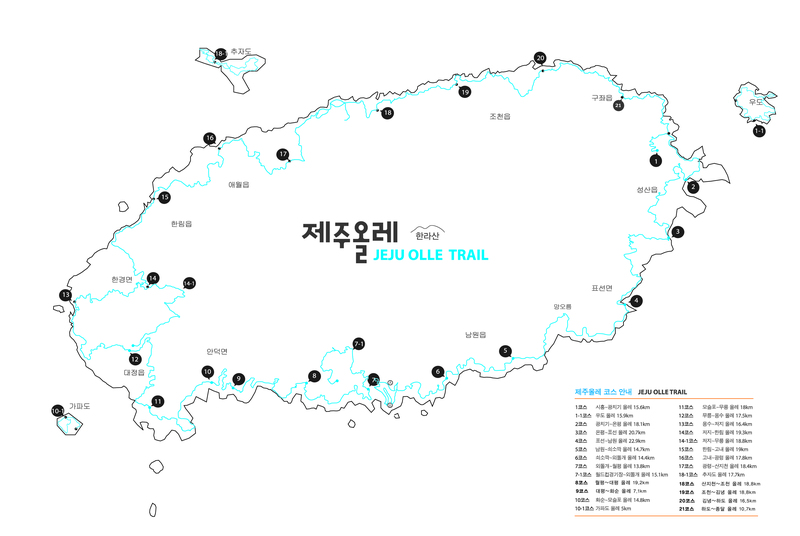 Jeju Island has seen a huge boom in guesthouses on various Jeju Olle Trail routes over the past few years. Many are in refurbished traditional houses or completely new builds. The owners come from varied backgrounds too. Many are mainland immigrants who have come to Jeju seeking a quiet and more laid-back lifestyle from that of the cities. Others are just retiring. Others have met on Jeju Olle Trail, gotten married, and decided to open their own guesthouse. Olle Walkers have successfully used these sites for making accommodation reservations near routes on the trail. Walkers have found it cheaper to book online and then go the accommodation. This can be cheaper than just showing up at the door. Some walkers prefer not to book ahead with their accommodation because they simply don’t know where or how long the day will lead them. If you do want to seek out accommodation by yourself then you’ll need to be looking for these signs with these words on. Make a note of these terms and show them to a passing local. They’ll put you in the right direction. There are no routes that have a camp site at the start or end point, though Route 10 does have wooden bases with metal hooks for tent guy ropes. You’ll find the routes that do have a proper camp site, well, the sites are in the middle, which is just not practical because you have to walk back from the end of a route. Camping rules are generally not hard-and-fast. It really depends on who happens to be around at that time and where you are exactly when you decide to camp. So at the end of the day if you can find a quiet, secluded corner, in a farmers field or a rest pagoda you will generally be fine. And if anyone does show up flash them a friendly foreigner smile and say ‘Jeju Olle’. Hopefully that’ll be enough for you to spend the night wherever you are and move on in the morning. Walkers can search guesthouse, minbak, or pension, in English near your location and it will translate that into Korean and suggest nearby places to stay. In 2016 the foundation opened the Jeju Olle Tourist Center in downtown Seogwipo City. We converted an old hospital into a restaurant, cafe, and meeting space on the first floor, the Olle headquarters office on the second floor, and our official Olle Stay guesthouse accommodation on the third floor. International walkers can use this place as their base camp while discovering the Seogwipo routes. Having English speaking office staff nearby will be great for any questions you have about getting around as well. Getting a place to stay on Chujado is generally one of the most difficult things to do for international walkers on the trail. We point many walkers to the Chuja Olle Guesthouse. This is where almost all international walkers stay for the night on the islands. Accommodation photos are here. One night should cost at least 20,000 WON. The problem is the owner doesn’t tend to answer his phone. So making a reservation in advanced is very difficult. However, if you can get there and the guesthouse is open the husband and wife team are very nice people. If you need help with Chujado send an email and we can try to contact the owner ahead of time. What are Olle Grandma Homestays? The Olle Grandma’s Homestays are a chance for Olle walkers to stay in a VERY local way with a Jeju grandmother in her home. It is also an opportunity for elderly grandmothers of Jeju to make some extra pocket money as well as keeping themselves busy into old age. The homestay program began as far back as 2007 with Jeju Olle Trail before accommodation options became widely available on each route. Where are the Olle Grandma’s Home-stay Located? The vast majority of the home-stays are located on Route 1 and Route 2 with one on Route 3 and another on Route 12. A stay will require some forward and active planning for international walkers. Most of the home-stays are not directly on a route either. They are almost all not near a start or end point. Walkers will have to go on or go back to their home-stay after finishing for the day. Walkers should expect a clean, but simple stay. Walkers usually have a room to themselves in a single storey house and will use shared bathroom and kitchen facilities. Bathrooms are usually Korean style with a wet room. Some places do not have WiFi, so if you are a walker who needs to be connected for one night then you might need to look elsewhere. Remember this is not a hotel or even guesthouse. Olle walkers will be staying in close proximity with the grandmother. It’s almost like staying with an elderly relative. Be mindful of this. Unfortunately this is where it gets even more difficult for international walkers on Jeju Olle Trail. None of the grandmothers offer online reservation options and none of the grandmothers speak enough English to make a reservation over the phone. Therefore walkers who do not speak Korean should have a Korean speaker call on their behalf. The office plans on registering the places with popular English language accommodation reservation web sites. There is the possibility of just arriving at the home stay and taking your chances, but this is recommended as a last resort. Please pay in cash to the grandmother upon arriving. If you cannot stay at the accommodation after making a reservation please, please, make contact so the reservation can be canceled. We cannot stress that enough and really hope for your understanding and etiquette on this point.